Everything we do in business is currently becoming digital: sending emails, signing contracts, attending meetings, even networking etc. But one thing that is not going to be fully replaced with digital stuff is Business card. If you are a business owner or any professional who’d love to connect with similar minded people and do networking, you must have a business card. There are multiple benefits of it. It helps you to connect with others from your industry and is considered a formal way of introducing yourself. Just using a single card, you are sharing your contact details, office address, and company website and so on in. Thus you save your new partner’s time, and it makes you look professional. Discover, even more, benefits in the below post and learn how to get your own perfect card in mere minutes. There are multiple ways to get your own custom business card. Today, I am going to tell you about a business card design program which I found recently and was very impressed by. That’s Business Card Maker from AMS Software: http://business-card-maker.com/. AMS is a well-known brand in making user specific tools and software and their business card tool is just amazing. You can use it to create as many business cards as you want and then print your design. So basically it is a business card design program which helps you make any amount of your own cards in a very affordable way. 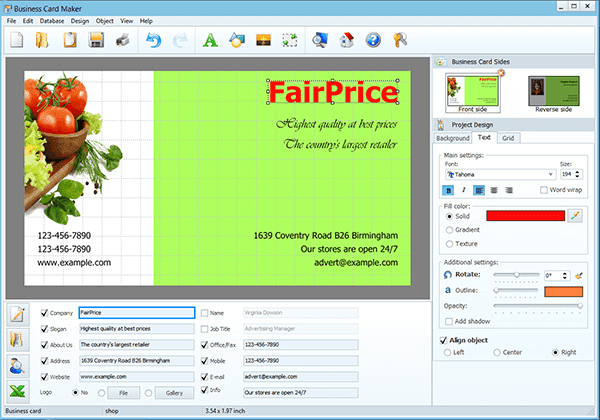 Business card maker software solves all the needs related to business cards and badges. With over 550+ professional templates in the library, this tool will help you to design an attractive card in less than 5 minutes without the help of any designer. All you have to do is, just select any of the pre-defined templates, edit the fields like name, contacts, emails etc. and see the preview. If that looks fine, get that printed! Also, the tool is highly customizable and so if you are bit creative then you can also design a card of your own. They have recently come up with the new updates with version 9.15 and tons of new templates have been added in this. The software is compatible with almost all the versions of Windows (10, 8, 7, Vista, and XP) OS and the size are 147 MB which hardly takes a couple minutes to get downloaded with decent speed. 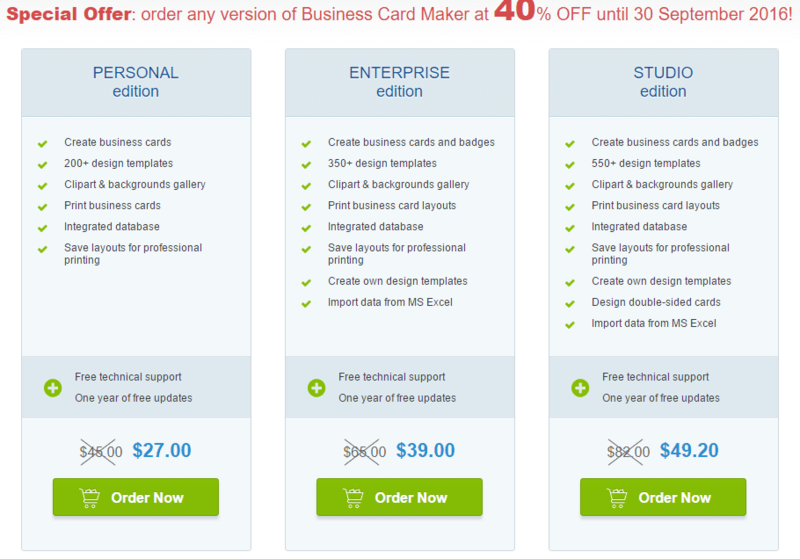 Business card maker is an all-in-one tool for all kinds of business card design. Here are some of its awesome features which will help you while designing your perfect business card. • Classic business cards with information about an employee and the company. 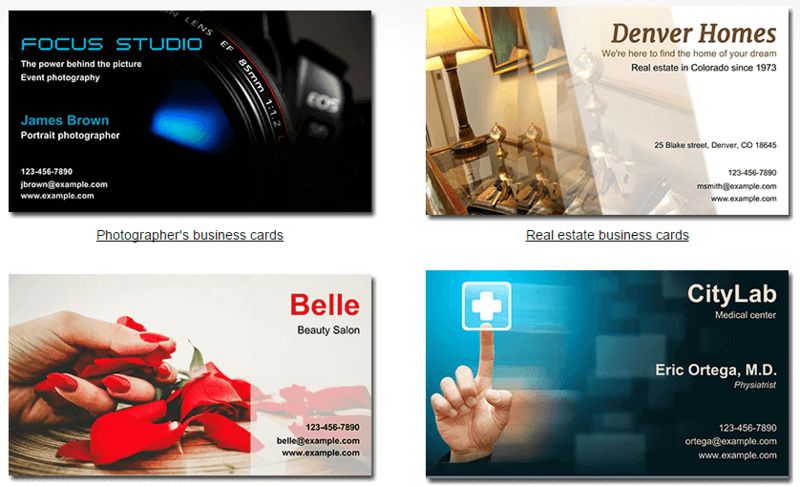 • Contact cards for entrepreneurs - great for freelancers, private doctors, lawyers, real estate agents, photographers etc. 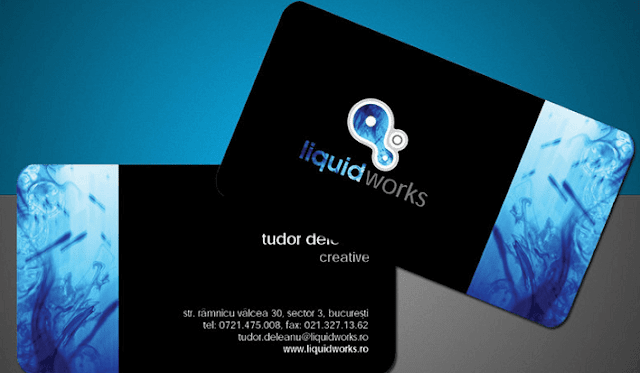 You can download this business card design program here: http://business-card-maker.com/download.php. Once downloaded, install it and start using the tool. The free demo lets you try out all the cool features and lots of templates. You can also refer to the tutorial section for a better understanding of how to use this tool. The company accepts all the major payment options including cards and PayPal for payment transfer. Once you are done with the payment, you will receive the license key in your email within 10-15 minutes. Not yet sure if you really need your own cards? Let me tell you why the business card is still important in today’s world and why you should have a pocket full of them at all times. 1. The business card shows you are professional! Sometimes a little thing we do sends a million dollar message to the community and makes a great impression. If you are in a networking forum or in a line for a job and you have a business card then suddenly, it takes you ahead of 99% others in the same queue. Networking is all about making good contacts from where you may get some help, some business contacts, and a good group. Sending contact information via text message or email or WhatsApp is fine but doesn’t make much impact. In networking forums, people usually get a chance to meet for a minute or two and if you waste that time by typing and sending the messages then I don’t think you are making good out of it. So it is a good practice to exchange business cards with a smile and use the remaining time for some meaningful discussions. Believe it or not, impersonal meeting makes a great impact. Email marketing, Text marketing and all other forms of marketing are doing amazing and produce some great results but still, direct marketing wins. You go there talk to your potential customers and then pinpoint the things they need and make sales. Have wondered why companies send their sales personnel to the client location? All the process is online and anyone can bid online but still, they send someone for a face to face meeting just to give some personal touch. The same is with a business card. You exchange the cards and put them in your wallet, laptop bag and whenever needed, just call/email the right person. You will often find people saying that he/she is mature enough to handle this and that. What is that maturity? If you are prepared enough to handle a task then you are good enough to go ahead and that is maturity. It is very necessary. Let’s say you are meeting someone after lots of work as the other guy is very busy or is at the higher position and when you met, you started searching for a pen and paper to share the contact details…how does the other guy feel? That is the reason you should do the preparation well in advance. There are many more benefits of having a business card and if you are in associated with any kind of business where networking is required you must understand the importance of having one. So hope you’re convinced now, and if you don’t have your own card yet, download the business card design program and make some! I would love to know if you possess a business card. If yes, share where you got it designed.